For other uses, see The customer is always right (disambiguation). Marshall Field used slogans such as "Give the lady what she wants" in his Chicago department store. "The customer is always right" is a motto or slogan which exhorts service staff to give a high priority to customer satisfaction. 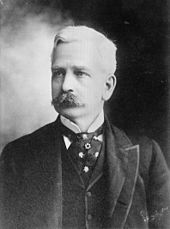 It was popularised by pioneering and successful retailers such as Harry Gordon Selfridge, John Wanamaker and Marshall Field. They advocated that customer complaints should be treated seriously so that customers do not feel cheated or deceived. This attitude was novel and influential when misrepresentation was rife and caveat emptor (let the buyer beware) was a common legal maxim. Variations include "le client n'a jamais tort" (the customer is never wrong) which was the slogan of hotelier César Ritz who said, "If a diner complains about a dish or the wine, immediately remove it and replace it, no questions asked". A variation frequently used in Germany is "der Kunde ist König" (the customer is king), while in Japan the motto "okyakusama wa kamisama desu" (お客様は神様です) meaning "the customer is a god", is common. However it was pointed out as early as 1914 that this view ignores that customers can be dishonest, have unrealistic expectations, and/or try to misuse a product in ways that void the guarantee. "If we adopt the policy of admitting whatever claims the customer makes to be proper, and if we always settle them at face value, we shall be subjected to inevitable losses." The work concluded "If the customer is made perfectly to understand what it means for him to be right, what right on his part is, then he can be depended on to be right if he is honest, and if he is dishonest, a little effort should result in catching him at it." An article a year later by the same author addressed the caveat emptor aspect while raising many of the same points as the earlier piece. ^ McBain, Hughston (November 1944). "Are customers always right". The Rotarian. pp. 32–33 – via Google Books. ^ Hotchner, A.E. (July 2012). "A Legend as Big as The Ritz". Vanity Fair. ^ a b Farrington, Frank (1914). "Successful Salesmanship: Is the Customer Always Right?". Mill Supplies. Vol. 4 no. 9. pp. 45–47. ^ Farrington, Frank (1915). "Is the Customer Always Right?". Merck Report. Vol. 24. pp. 134–135. Benefiel, Margaret (2005). Soul at Work: Spiritual Leadership in Organizations. Church Publishing. Craven, Robert (2002). Customer is King: How to Exceed Their Expectations. Virgin Books. Freiberg, Kevin; Freiburg, Jackie (2001). Nuts! : Southwest Airlines' Crazy Recipe for Business and Personal Success. Texere. ISBN 9781587991196. Henney, Nella Braddy (1922). "The Value of Courtesy". The Book of Business Etiquette. Garden City, NY: Doubleday, Page & Co.
Iacobucci, Dawn; Grayson, Kent; Ostrom, Amy (July 15, 1994). "Customer Satisfaction Fables". Sloan Management Review. Vol. 35 no. 4. pp. 93–96. Woods, Allan; Hebron, Lesley; Bradley, Sally (2001). Customer Service: S/NVQ Level 3. Heinemann. ISBN 9780435452278. This page was last edited on 23 March 2019, at 15:09 (UTC).